Marvin Andrews finally has his first cap under his belt. He started for Raith Rovers on Saturday afternoon in a 1-1 tie with Airdire. According to reports he had a good game and proved to be worth the wait for the Fife based club. However, he did not escape being booked by the referee. This from the Raith Rover's homepage: "Our new marvellous defender, Marvin Andrews, had a couple of good chances to score that were saved well by Airdrie's 'keeper Martin. Firstly, a cross from the left by Stein saw Marvin charge into the box and poke the ball goalwards, but it was scrambled away." You can hear Marvin's post game comments if you have real audio. If you need the software you can go to the stadium. The tie keeps Raith in the running for a promotion into the Scottish Premier division. Clint Marcelle and Barnsley is out of the F.A Cup. They lost to Newcastle 1-3. The lost means that Barnsley will not be playing in Europe next season and can now concentrate fully on remaining in the the English top flight. Marcelle started but was replaced in the 55th minute. Barnsley was simply out played by the North England club. On the other side Shaka Hislop played his usual role of back up to Newcastle's number one goalkeeper. Yorke and Villa move up. Dwight Yorke and Aston Villa continue to make progress up the English Premier League table. They completed a 1-0 win over Chelsea. Yorke working up front with Joachim ran at the heart of the Chelsea defense often confusing them with there pace. Joachim scored Villa's goal in the 51st minute. The win moves Villa into 13th position and out of relegation danger. There are strong rumors concerning the future of Russell Latapy at Boavista. According to his local business manager, Russell has been in contact with two clubs concerning a possible move to the English top flight. The first club interested in him is Leeds United. A few weeks back Russell was in England regarding a move to Leeds United. Leeds is currently in seventh position in the English Premier division and are currently battling for a European position. Also in the running for Latapy's services is Aston Villa who have shown interest in Latapy as early as last season. They were willing to pay £6,000,000 in transfer fees for the midfielder. A move to Aston Villa will be a Trini dream come through as he will work with his friend and compatriot Dwight Yorke. There partnership dates back since 1989 when they played together on the "Strike Squad." 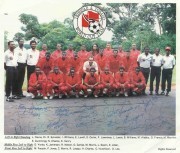 Should Latapy move on to England he will become the fourth Trinidad and Tobago player in the league. The transfer deadline is March 26th.